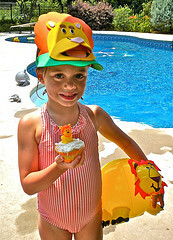 A Lion King party is a great kids pool party theme. Our granddaughter is enthralled with lions, having just watched the Lion King movie for the first time. 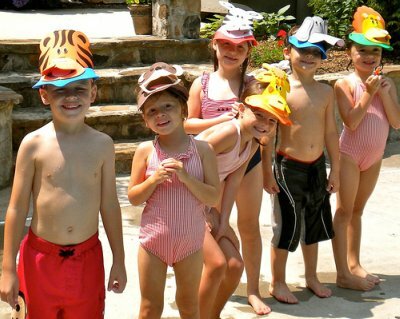 So if you are looking for kids pool party ideas, here is one that was a big hit for kids ages 2-6 years old. Lion King party supplies can include the real Disney Lion King trademark paper goods or as you can see for our party, we used brightly colored, happy looking lions. Although, we didn't use the real Disney Lion King trademark party goods, the kids had fun with the colorful lions that showed up at the pool gate, the steps, the pool and the party table. Keep the same color scheme going starting with the invitations. I usually buy the themed paper plates then use solid color napkins and cups. 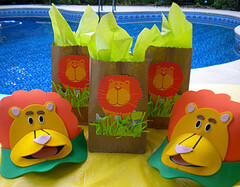 These lion invites set the theme and color scheme for our party. Not only were they used for invitations, but I bought an extra set to use on the party bags. I love the colors of yellow, orange, green and brown for this kids pool party theme. If you decide to go with these invites, you can also get matching plates and napkins. I bought the party plates and then used solid orange colored napkins.. 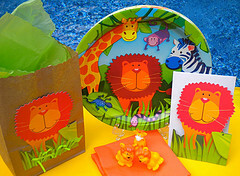 Jungle Animals Dessert Plates, 7"
Most often my party supplies do double or triple duty. 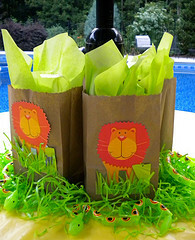 For this Lion King party, the party bags also served as the centerpieces. Use bright lime green tissue paper in the party bags to add extra color. Four bags were placed around the patio umbrella with green grass sprinkled in between. Several plastic snakes sat hiding in the grass as well. The birthday girl got the lion visor while the rest of the guests picked out their favorite animal visor. The same with the jungle themed beach balls - the birthday girl got one of the lion beach balls set apart just for her. 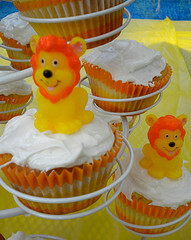 Instead of cake, cupcakes were served topped with little lion plastic finger puppets. The kids loved them - that is the cupcakes and the finger puppets. The finger puppets could be played with in the pool and then taken home as party favors. An assortment of Jungle Animal Beach Balls were floating in the pool when the kids arrived. We always have some kind of themed inflatable or beach balls for our pool parties. When the kids first walk into the pool area, that is what they notice first. It gets them excited to get into the pool and start the pool games. The beach balls became the prop for many of the Lion King games and then served as take home party favors. Fun cupcakes make the perfect Lion King Cake. 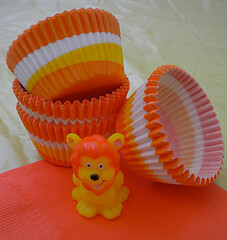 Lion plastic finger puppets are the cupcake toppers. Chocolate sprinkles and green sugar can be sprinkled on the top of the frosting. Display your creation on a cupcake stand and use it as a centerpiece. We found these cute plastic yellow and orange lion finger puppets from Oriental Trading. Finger puppets are a lot more fun and a lot more safe than cupcake toppers that use toothpicks. Not only are the finger puppets colorful, they make a great little take home party favor as well. Bright yellow and orange cupcake liners that actually keep their color make for a more colorful cake. These liners are heavy duty so they are more expensive. But the colors don't fade if you make a white cake like they do with the cheap liners from the grocery store. If you make chocolate the colors are less vivid. I figured since I am not spending money on a store bought cake, spend the extra money to make your cupcake creations pop with bright orange and yellow, instead of a dingy, faded color. Because they are heavy duty, they can be used to serve snacks like candy, popcorn, pretzels, small crackers or fruit. I found my liners at Tuesday Morning. Another way to bring color to your cupcakes is to use cupcake wrappers. I used to make my own from scrap booking paper but they are now readily available and cheap that it's not worth the time anymore. 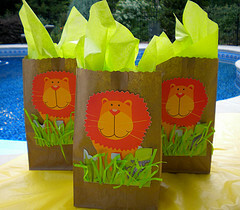 Lion King decorations like these party bags are made from brown paper lunch bags, cut out lions from the party invitations and some green grass. These colorful bags take center stage as the table centerpiece. I ordered extra Lion Birthday invites and used them for the party bags. I cut out the lion and glued him onto inexpensive brown paper lunch bags. Extra strips of green grass (stiff Easter grass) were added with a glue stick. Trim the top of the bag with a decorative scissor for a more finished look. Top the favors with lime green tissue paper for extra color. I found these plastic lions from Birthday Express and then added some jungle stickers and plastic snakes. Other ideas are animal crackers and jungle tattoos. 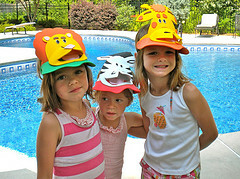 The kids also took home their jungle animal visors and beach balls as party favors. 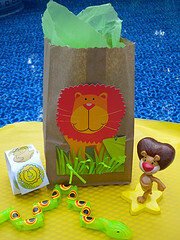 Scatter some green "grass" around the base of the party bags and "hide" some sneaky snakes in and among the greenery. Later use them as take home party favors. Trim the top with decorative scissors and embellish with some green grass. Top the bag with lime green tissue paper. These party bags served double duty as party decorations and take home party bags. First impressions, whether it is the pool gate or your front door, let's the guests know that this is going to be fun. Greet guests with lots of balloons by the mailbox, front door or pool gate. Jungle Animal Print Safari Balloons 50PC, 11"
Place lion paw prints on the sidewalk leading your guests to your pool entrance or to your front door. 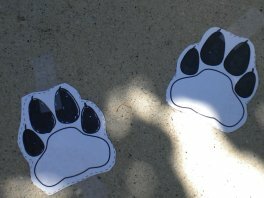 The kids loved these and tried walking on them coming to and leaving the party. 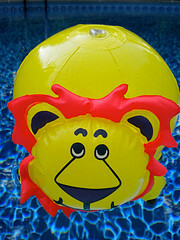 Place inflatable lions at the pool entrance, on the party table or floating in the pool. Depending on how many you buy, you can let the kids take them home after the party. Since our color theme was orange, green and yellow, I couldn't resist these bright orange giant pinwheels that were half off at Hobby Lobby. They were placed at the pool entrance and by the pool steps. Twirling throughout the party, the kids loved watching them spin. OK, this is really a kid's hamper, but it worked great sitting by the garden arbor as kids walked to the pool. Later we used him for our lion king games. I bought it at Target for around $6.00. 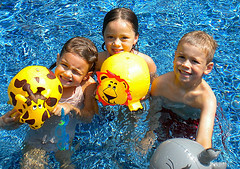 Floating Jungle Animal Beach Balls decorated the pool and got kids excited to start the pool party games. The guest of honor got the lion beach ball. These fun beach balls served as party decorations, floats for lion king games and as take home party favors. Painted paper plates decorated with lion face craft kit were placed on a dowel with streamers of crepe paper and strips of tissue paper. 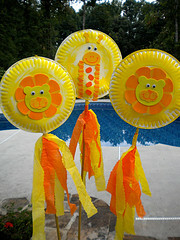 The kids used these jungle party decorations for the Lion King Parade around the pool, to the Disney song, "I Can't Wait to be King." Picking a color scheme is necessary for any party decorating. As you can see the colors were repeated in the party bags, the pinwheels, and even the beach balls and visors. Once everyone arrives start the pool party with a Lion King Parade. 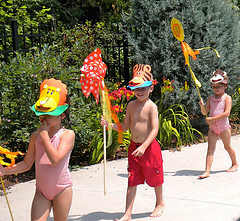 With each child wearing a wild animal visor and carrying a decorated lion stick or pinwheel, have them dance around the pool to the Disney song, "I Can't Wait to be King." If you have an iPod just download the Lion King album and play it on your outdoor speakers or on a portable, iPod speaker. Use the album as background music throughout the party. 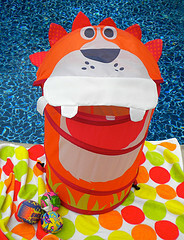 This orange nylon lion hamper (I found it at Target) greeted the guests at the pool gate and then we used it again for one of our Lion King games. One child holds the lion in the pool while the others line up and try to toss the fish into the lion's mouth. Everyone took as many turns as they wanted, with no winners or losers. Splash balls could be used as well for this pool party game. Lion King games were played in and out of the pool. Feed the Lion was a big hit as the kids tried to throw the fish into the lion's mouth. At this age we didn't really have teams or winners. Everyone played and tried as many times as they wanted to. Instead of plastic fish you can also use splash balls. Provide jungle animal beach balls for each guest. 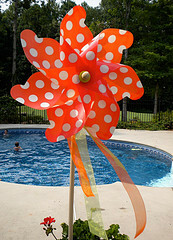 Have them floating in the pool when the guests arrive as pool party decorations. 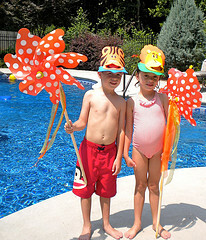 After the Lion King parade instruct the kids to do a Lion's Leap into the pool to find their beach ball. If the kid's can read you can have their names on the beach ball or they can just swim to the animal they like the best. Looking for swimming pool games to play for this party? Have two different split ring floats - one for the monkey team and the other for the hippo team. 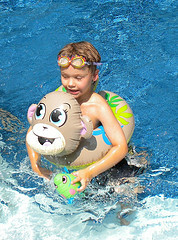 A split ring monkey float is easy to find in the beginning of the summer. We bought the monkey and the hippo one at our local grocery store. The teams simply race each other to the other side of the pool. With this age group we really didn't recognize winners or losers, we just let them have fun. Some wanted to do it several times, and that was great too.